Scout Trip December 8th-9th 1990. I had been warned that the weather forecast had predicted that the 'Four horsemen of the Apocalypse' were due at the weekend. However I still decided to head up to the Alport Hut with eleven scouts in a minibus. The phases "What could possibly go wrong ?" and "We'll be OK" were ringing in my mind. Entirely as predicted three feet of snow decided to come along at the same time. 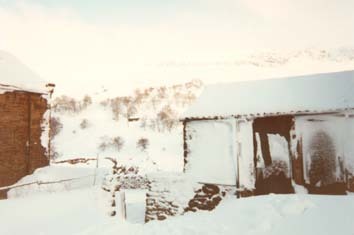 As we wandered around in the snow trying to find the hut we realised that the hut was double booked by friends from the 168th Derby Scouts. They had turned up slightly earlier with three leaders and four scouts. After a very character building weekend involving clearing a one mile stretch of cart track of up to four feet of snow we got back to Derby late on Monday evening. This is on the Saturday morning after the blizzard on Friday day. We realised that we would not make it home by Sunday night. The Scouts were overjoyed at the prospect of a day off school. The Leaders were less certain about the situation. These pictures are courtesy of William Bugg. This is some of the scouts showing concern about being stranded in the snow. The more enterprising members of the scouts were rumoured to be selling 'Mars bars' for 50p each. 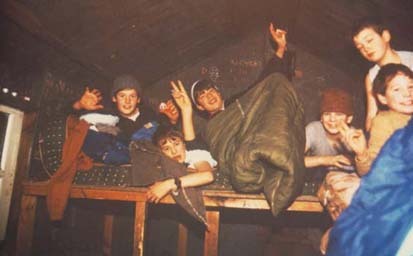 This is the 158th Scouts crammed into the hut bedroom, the 168th Scouts slept in the kitchen. This is a view down to the Alport Hamlet from the hut. Scouts from the 158th who survived the experience were William Bugg, Paul Furmston, Paul Gamblen, Andy Gregory, Charlie Binns, Robert McGuckin, Ian Goodall, Matt Smith, Ian Boyer, Jonathan Pither and David Stacey. For the Sunday evening we slept in the camping barn at Alport Castles farm due to the fact that it gave us more space. We were getting rather short of food by this time and just had two tins of rice pudding for tea. We celebrated William Bugg 15th birthday that evening. Due to the hard work of digging the snow and the lack of heating and lighting the scouts were in their sleeping bags and asleep by 7pm, almost unheard of. We arrived back in Breadsall late on Monday evening all very tired. 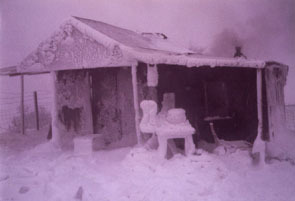 The scouts were slightly disappointed to hear that Heanor Gate school had been given Monday off because of the weather. 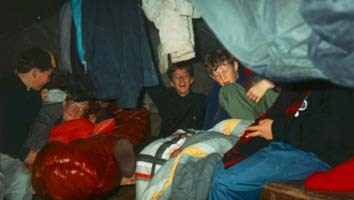 August 18th to 19th 1990, Scout Trip. Me, Matt Smith, Daniel Busman, Robert McGuckin, Richard Hall. Friday 17th - Meet at 7.30pm. Flod turns up in his Dads rover. Call in at the Yorkshire Bridge, up to Alport for 10pm. Flod goes back. Soup for supper after struggling to find the water hole. Bed for 12.30. Saturday 18th - Up for 9am, bacon and eggs, wash up and set off walking by 11am. Walk over the top to Howden, then round the top of Howden and down Derwent reservoir. Very hot day, I just walk in shorts. Stew followed by stream puddings for tea. Lit the stove and play cards till midnight. Sunday 19th - Very heavy rain, play cards till 12.30. We have a large cooked brunch. Have a small walk up the valley at 2pm. Flod comes up at 5pm, pack and then home for 8pm. 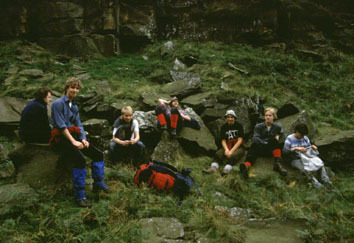 April 22nd 1990, Scout Trip. Me, Andy Gregory, William Bugg, Paul Furmston, Matt Smith, Daniel Busman, Bunce, Mark Ecob, Lee Pollard. Thursday 19th - Lee and Bunce go up on the train in the afternoon to Hope. They walk over to the hut. I leave Breadsall at 7.30pm. Flod gets the company van from Nottingham. Unload at the farm for 10.30pm. Flod drives back. Everything up to the hut for 11.45. Friday 20th - Rain and mist all day, collect a lot of wood, put up the toilet tent. Play cricket on the back lawn. Have lunch in the hut and then walk up to the castles and along the ridge. Corn beef hash and then an early night. Saturday 21st - Up for 9am, bacon and egg for breakfast. Flod arrives for 10am, he had a puncture on the way. Very misty, walk round Edale End to Edale, there for 3pm. Walk up Ringing Roger and then over the top. Have a bog jumping competition on the other side. Stew for tea. Play the match game. Lots of discussion about the draw to empty the toilet. Sunday 22nd - Lie in, large breakfast. Have the draw, Lee and Matt do the deed. Take Lee and Bunce down to the station for 12.30. Take all afternoon to carry the stuff down and load up the cars. Stop for chips in Matlock, home for 8pm. December 8th 1989, Venture Trip. Me, Adjy and Andrea, Quince, Gee, Jamie Widdop, Flod. Saturday 9th - Me, Quince, Flod and Jamie Widdop walk over Kinder. The others drive round, meet them in the Jolly Rambler. Gee drives us over to the George at Castleton. Corn beef hash for tea. In the evening we go back to Castleton and go to the Cheshire Cheese. Sunday 10th - Gee and Quince leave at 8am. Walk up to the top of the castles for the usual view down the valley. 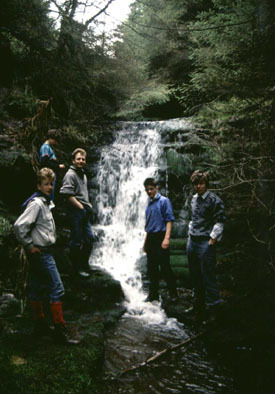 March 25th to 27th 1989, Scout Trip. Me, Flod, Anna, Robert Benson, Mark Benson, Johnny Hammond, Mark Ecob. Friday 24th - Pick up the scouts at 7pm, pack the stuff into the cars. Flods throttle cable breaks, switch to his dads car. Call in at the Yorkshire Bridge to 'check the directions'. Get up to the hut for 10.30pm. Lots of egg banjos, get to bed for 12.30. Saturday 25th - Up at 9am, good breakfast away by 11am. Go to the Snake Inn, then the Snake path over to Kinder downfall. They all enjoy going over Kinder, walk round the edge, back for 7pm. Stew for dinner. Anna and Bense turn up at 9pm. Play cards for a while. Everyone is very tired. Sunday 26th - Get up for 9am, set off walking up the valley at 11.30. Get almost to the top of the valley, following the stream all the way. Have sandwiches back at the hut. Go and build at aerial runway from a tree to a post round the back of the hut. Anna and Flod go to the pub for a while. We cook a very good spag bol for tea. Monday 27th - Lie in till 9.30, very sunny day. Take the scouts up to the top of the opposite hill and then 'discover' a hidden valley to the farm. Have beef burghers and then start coming home. Big queues in Chatsworth so cut across to Chesterfield. 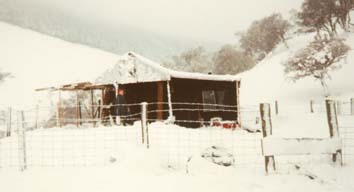 December 3rd to 4th 1988, Scout Trip. Me, Flod, James Widdop, Mark Benson, William Bugg, Andy Gregory, Jimmy Knifeton, Mark Ecob. Friday 2nd - Pick up Belper Van and get on our way for 7.30pm. Call in at the Yorkshire Bridge to 'pick up the key'. Rains all the way. Up to the hut for 10pm. Saturday 3rd - Get them up for 8am, breakfast of sausage and eggs. Set off at 10am for a walk over Kinder Scout to Edale. Get there for 1pm, eat our sandwiches. Arrive back to the hut in the dark and rain. Have a good fire and cook corn beef hash for tea. Try to cook an frozen uncooked apple pie on top of the fire. Play cards till midnight. Sunday 4th - Get up at 10am, Flod takes them down the bank. They all get very muddy. Beef burghers and steam puddings for dinner. Not get away till 4pm due to the rain. I didn't go in 1987 ! November 28th 1986, Venture Trip. Me, Heather and Clive, Quince, John Widdop, Robert Benson, Matt Lister, Mark Pollard and Anna. Friday 28th - Leave after scouts with Robert Benson, Matt Lister, Mark Pollard and Anna, just get to the Yorkshire Bridge in time, the ventures are just leaving. Saturday 29th - Get up at 8.30am. Walk up the Roman road and other Kinder. Goes very dark on the way back. Start cooking corn beef hash when we realise that some of the food has been taken. 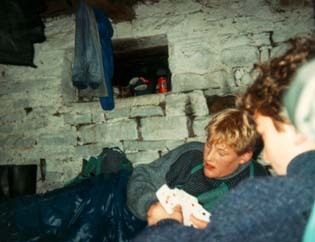 Clive, Quince and John nip out for supplies, others stay in and play cards. Sunday 30th - Get up late and walk up the valley. Anna and Clive fall in the river. 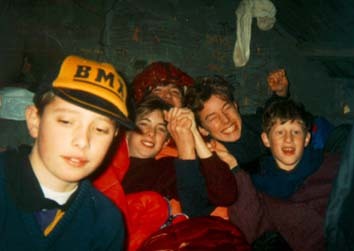 January 10th 1986, Scout Trip. Me, Dave Elks, Kevin Clarke, Robert Benson, Mark Benson, Matt Lister, Roger Godber, Johnny Davis, Mark Antill, Jonathan Jupp, James Widdop. Friday 10th - Leave Breadsall at 7.30pm, Mr. Pollard and Mr. Benson drive up with us and take a trailer full of stuff, Dave and Min take their cars. Lots of ice on the track, have to chip in off with shovels. Take all the stuff over the river, have coffee, bed for 1am. Saturday 11th - Get up for 8.30am, they are all very exited, most of them have not been here before. Take them over to the other side of the valley and do some 'Plaggy Bagging' on the snow. We have races down the hill, everyone gets soaked. Lit the stove and start working our way though a 55lb bag of coal. In the afternoon Dave takes them up to look at the tower, the lake is frozen over. Do some badge work, I set a course of compass bearings. Most of the scouts are exhausted and go to bed at 7pm, asleep by 8pm. Play cards with the remaining scouts. Sunday 12th - Everyone up by 9am, more badge work. Take them for a walk to the top of the opposite ridge. Pack up and leave by 5pm. October 4th 1985, Venture Trip. Me, Heather and Clive, John Widdop, Quince, Claire Munson, Phil Harris, Mark Robinson. Friday 4th - Drive up to Alport with Clive and Claire Munson, just catch last orders at the Yorkshire Bridge. John Widdop and Quince cycled up during the day. Put the toilet tent up in the dark and wind.